As a general sense I know that cis isomers are less symmetrical and more polar in nature whereas trans isomers are less polar. Now given those information, would it be appropriate to assume that cis isomers are more water soluble owing to their polarity? 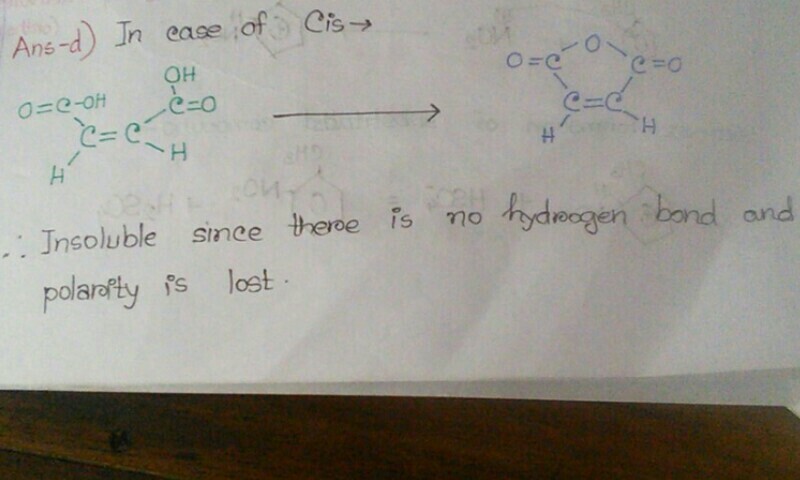 Also there was a discussion in our class where my teacher told us that between the cis and trans Butenedioic acids, the cis acid is not water soluble on account of the fact that it undergoes dehydration and the carbonyl groups are bonded by an oxygen atom in between eliminating hydrogen bonds (??). I would like to know if there is any constant character when it comes to solubility of cis and trans isomers. That's not quite correct and can be quite easily to be shown as wrong by looking up data tables and/or MSDS. Fumaric acid (the common name of the trans-isomer) is less soluble, with a solubility in water of 4.9 g/L whereas maleic acid (the cis-isomer) has a solubility of 478.8 g/L. Maleic anhydride would also react in water to form maleic acid. Actually in the cis isomer there is a repulsive force acting between the molecules but when we see the trans structure there is a compact structure, there is less repulsive force... so due to this repulsive force the molecules in cis isomer will be farther from each other and hence will be more soluble. Not the answer you're looking for? Browse other questions tagged solubility polarity isomers hydrogen-bond or ask your own question. How do I figure out the relative polarity of organic compounds? 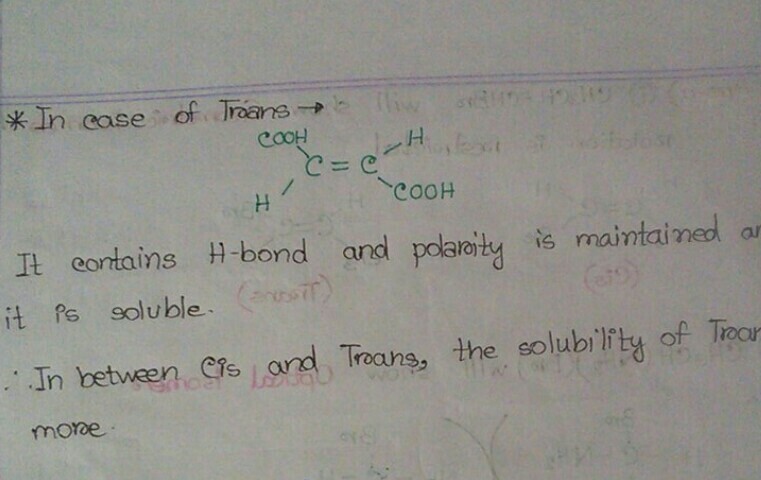 Stability of cis vs trans isomers? How to identify cis-trans alkene isomers? Why are amines more soluble than ethers in water? Which is more soluble in water, HF or SO2?